Some of the best performing Leaving Cert students in Ireland come from St. Colman's College, Fermoy. 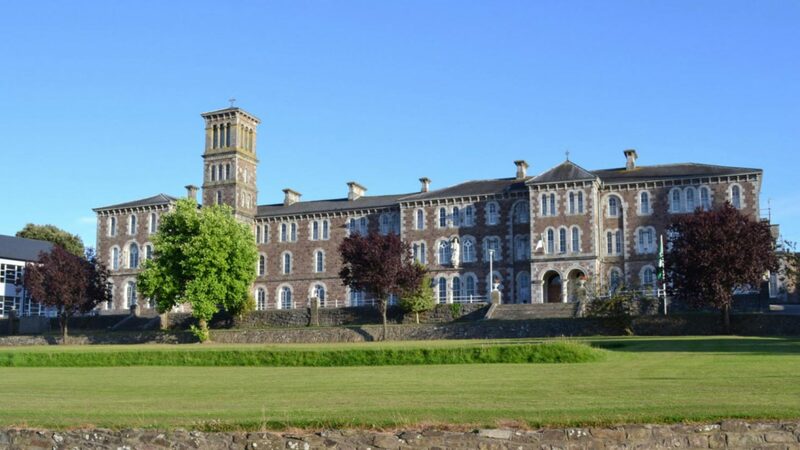 According to the 2015 Sunday Times 'Guide to Ireland's Top 400 Schools', St. Colman's ranked seventh highest in boys' non fee-paying second level schools and fourth in the Cork region. The guide ranks schools by the progression of students to university. 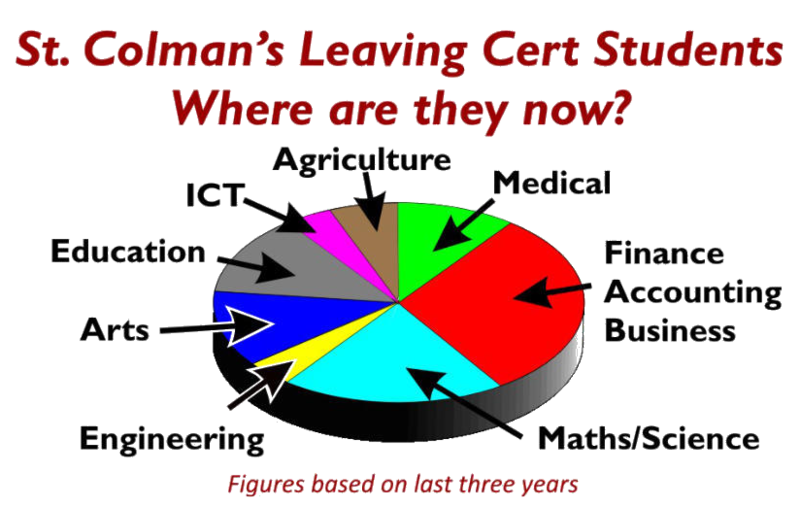 While 56% of St. Colman's students progressed to an irish university, a further 86% went on to higher education (UK, Ulster Universities, I.T.s etc.) A further 11% went on to further education, apprenticeship or agricultural college. These figures show that St. Colman's offers great opportunities to progress in any chosen field, be it educational or vocational. Last year the College continued its policy of pursuing numeracy and literacy as 73% of Junior Certs took higher level Maths (national average 27%), while 94% took higher level English (national average 67%). Each of these areas impact on other subjects as students are encouraged to sit as many higher level papers as possible. 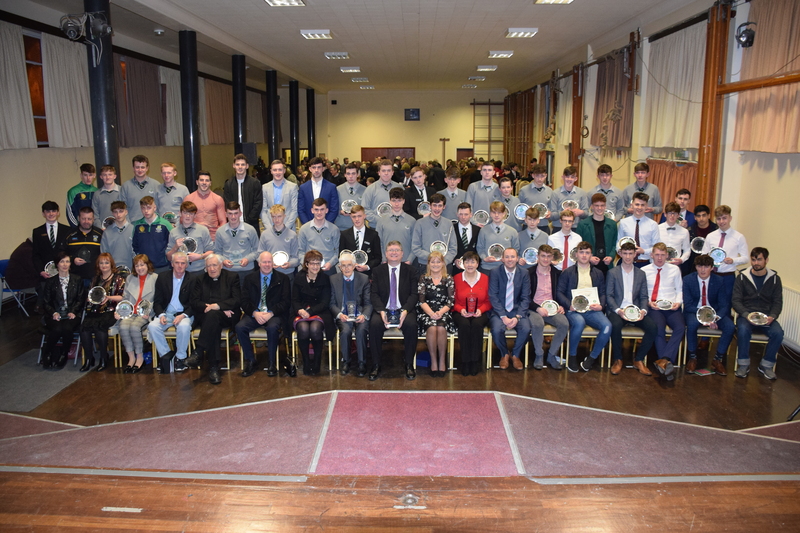 St. Colman's continously encourages its boys to challenge themselves to achieve their full potential and beyond, in all aspects of school life. This is reflected each year in their consistent success rates. "The standard of teaching and learning observed during this inspection was consistently very high and on several occasions, excellent." For the second year running top Leaving Cert students in St. Colman's have been awarded Quercus scholarships to UCC. Class of 2014 student, Cormac Mulcahy, who scored 7 As and 615 points and went on to win the Quercus 2014 has now been joined by top 2015 leaving cert student Tom Collins, who is 2015 winner. 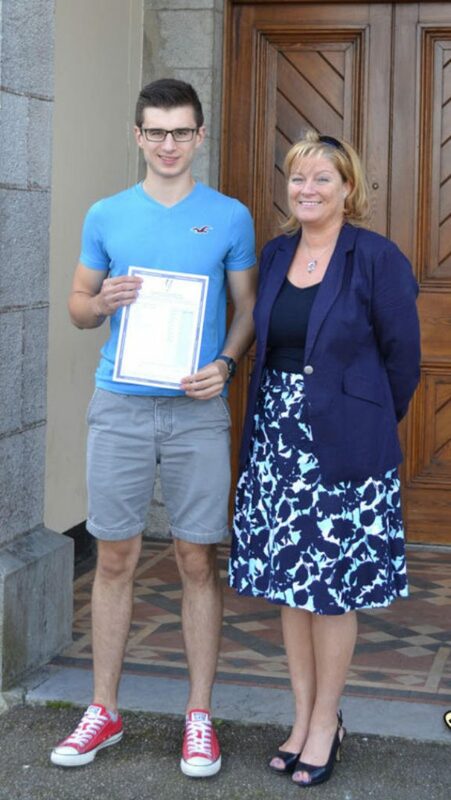 Tom scored an impressive 7 A1s in his higher level leaving cert. St. Colman’s College encourages everyone to excel and aim high in all that they do at school, whether in academia, sport, art, music or drama. A strong academic focus is at the heart of the College and is based on the principles of encouraging lifelong learning, independence and a culture of intellectual curiosity. Supported by dedicated and inspirational staff, pupils are challenged to question, to be reflective and to develop the life of the mind. St. Colman’s has always had a strong academic tradition, with an impressive track record of excellent examination results. The vast majority of our pupils secure third level places comfortably in a widening range of disciplines including medicine, finance, business, economics, engineering, sciences, agriculture, as well as the traditional trades. In the past three years one of our sixth year students secured Ireland's top leaving certificate grade, at higher level, for his Design & Communication Graphics paper; three students received Entrance Scholarships based on their academic achievement in the Leaving Certificate; two in Trinity College Dublin and another pupil at University College Dublin. In addition to these, two more Colmanites received JP McManus scholarships. The College also has an established reputation for sporting excellence, both within the school, throughout the region and increasingly, nationally. Our excellence at a competitive level works hand in hand with a strong school ethos of embracing a ‘sport for all’ philosophy.The provision of the arts and music at the College gives pupils of all talents the opportunity to experiment and excel. Recently drama has had a revival with stage performances each year, as well as frequent talent shows. 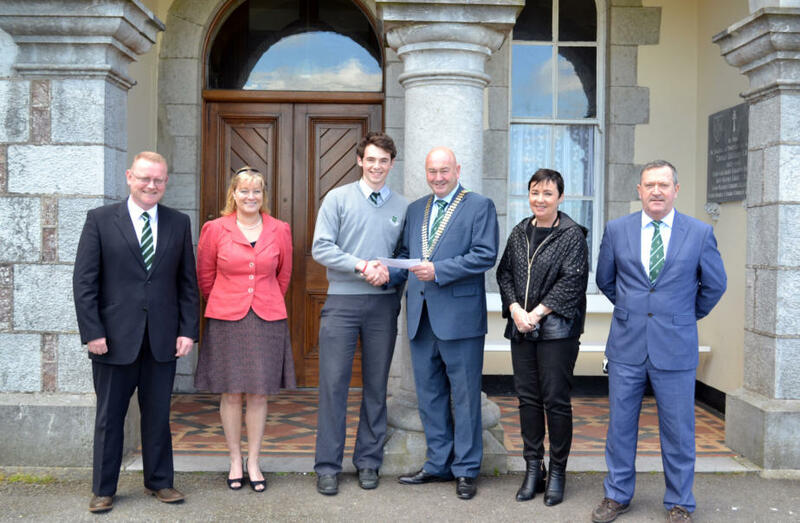 Rory McEvoy, a fifth year student in St. Colman's College, Fermoy has been chosen to partake in the NASA United Space School programme for 2015. Held each year in Houston, Texas, the programme brings together up to fifty students from twenty five nations to study under the mentorship of space engineers, scientists and leaders in the aerospace industry. St. Colman's College and Loreto Fermoy are the only two participating schools in Ireland for this programme which begins in July. In St. Colman's, Rory emerged as the winning student after undertaking a selection which included application, interview and essay. 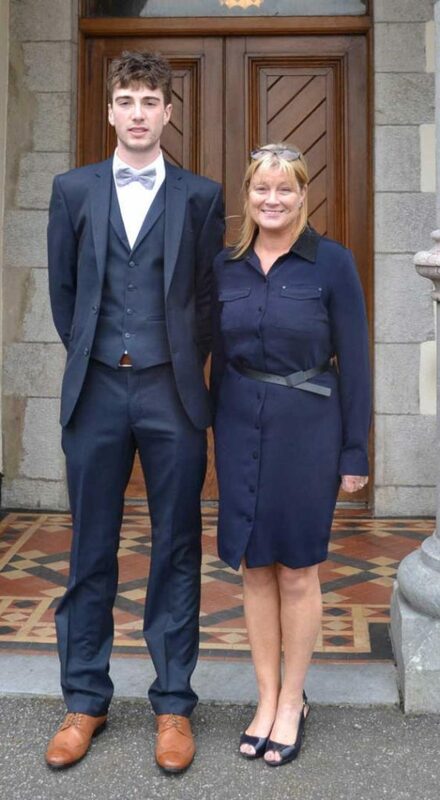 The final selection was weighted by academic excellence particularly in Physics as well as students' citizenship skills within the school.Rory is being assisted on his travels by a contribution from the St. Colman's College Parents' Council as well as a PPU bursary contribution. On his return, Rory will prepare a presentation of the trip for his peers.